molto bella .. adoro la pochette! El pantalon lo tengo yo q tambien lo he sacado en el blog, me encanta!!! Estas muy guapa!!! Pasate por mi blog!! ;) Un beso! That sequin shirt is very cool, love it! Me encanta este total green con toques negros! A mi me encanta el verde y a ti te sienta fenomenal. Me encantan los pantalones. Yo también suscribirse a su blog ..
usted tiene un buen estilo. Me gusta cómo combinar las prendas. Great look I love the color combination! This is an awesome look - love the slouchy pants, that color is just fabulous! 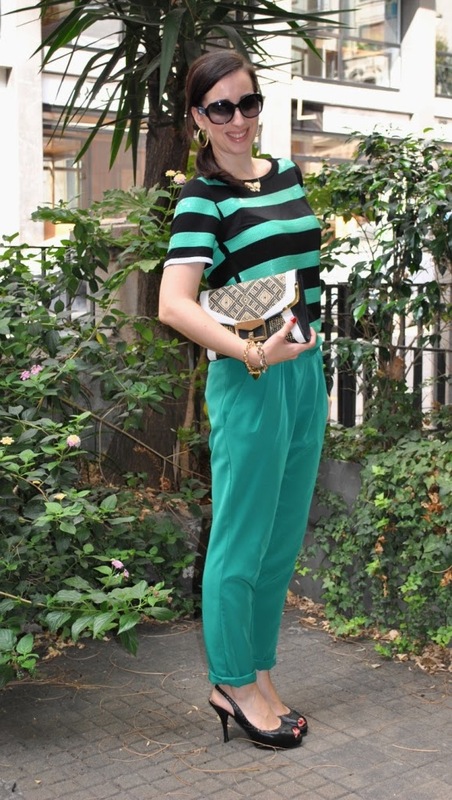 Amazing look dear, love how green looks on you! I think that you look fantastic. The striped shirt looks fab! pretty in green :) so classy outfit. qué guapa Patricia! me encanta el look! el verde me fascina!!!!! y esos pantalones son chulisimos! you're beautiful green lady, love the outfit head to toes ! I'm loving all this green! And those pants are just amazing! Love them! What a beautiful top! I love the sequins in it which makes it so fun & flirty! I have a hard time wearing sequins..they make my skin itch. Bonitos pantalones! encuentro muy gracioso el collar! You look so great in that colour! It really looks fabulous with your dark hair! I don't have many green pieces in my wardrobe, but I would love to add a few more! you are gorgeous in green my dear! I'm drooling over this outfit, love it! Super cute, I love the monochromatic look mixed in with stripes! I love your sequined striped top - so chic! I just started a blog and would love it if you checked mine out! Hola!!! Qué blog más bonito, acabamos de describir tu blog y ya te seguimos!! Nosotras tenemos otro de moda: De compras con mi hermana! HI! I just came across your blog! I like your posts, very nice style. Just started following. very nice outfit - lovely shoes ! !